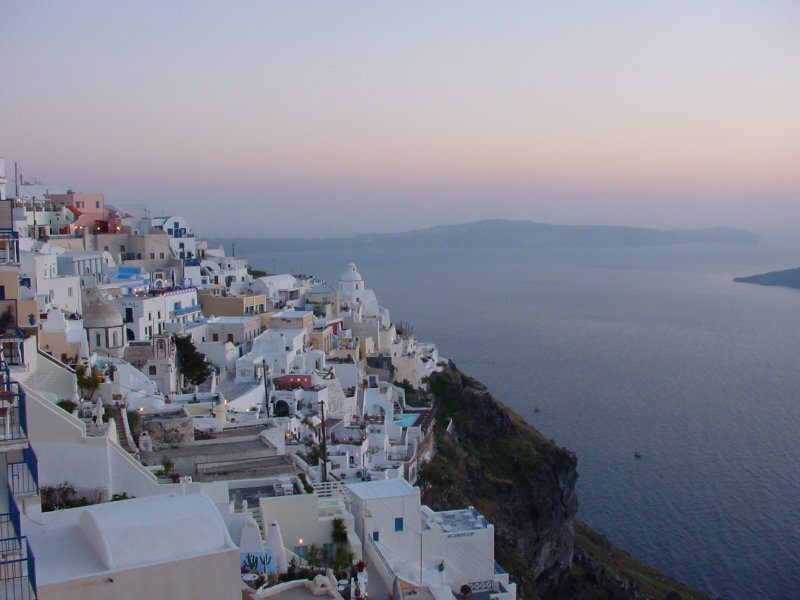 When you think of Greece these days, you sadly might think of financial crises, bailouts, maybe even riots in the streets. Don’t think of those things. Don’t even think of Greece at all. 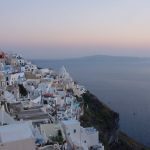 Instead think of the Greek island of Santorini, a beautiful if slightly forbidding sun- and wind-swept island about halfway between Crete and the Greek mainland. The site of a massive explosion about 1600 BC, the middle of the island sank into the ocean, leaving Santorini a crescent-shaped, rugged, steeply-terraced landscape based on deep layers of volcanic ash and schist, metamorphic rocks that are high in minerals and whose name, coincidentally, derives from a Greek work that means “to split,” referring to the way the rocks fracture along the plane that the minerally deposits form. 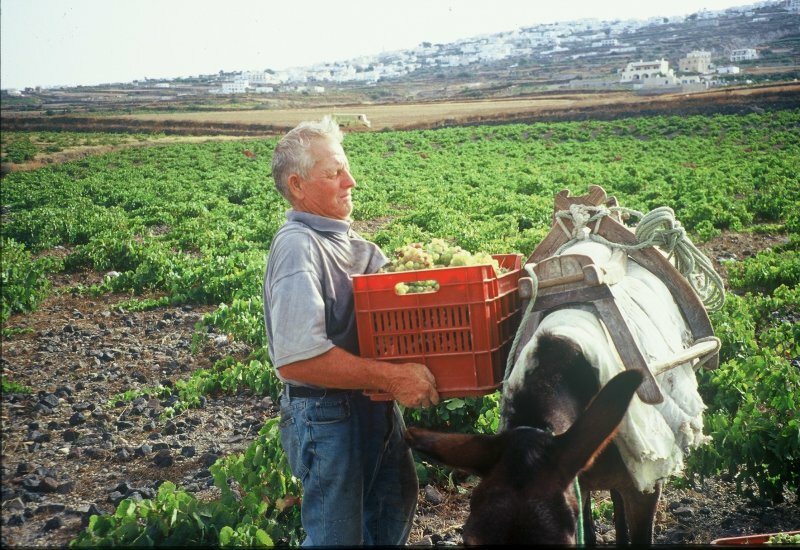 “Minerally” is an important word for wines on Santorini as we’ll see. There are 10 wineries on the island, and all but one, Domaine Sigalas, are located in the south of the crescent, which also happens to be in the geographical south. 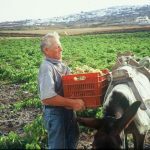 Evidently they are struggling – tourism is the island’s mainstay, and winemaking has become monumentally difficult, which stands to reason. Why? Well, the island gets remarkably little rain, around 12-14 inches a year. The winds are ferocious, the grape yields per vine are miniscule, and, frankly, most of the world has never heard of the grape or the wines. There are only about 1400 hectares, just 3460 or so acres of vines under cultivation on the island. You’ve got to give these vintners credit for keeping to their craft despite the challenges, and their unique wines-and they really are-are something you need to try. Vines here are grown in a method that frankly I’d never seen. 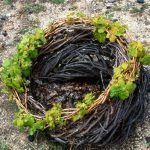 Instead of trained onto wire trellises or simply allowed to be naturally “head-trained”, they’re woven into round baskets using a method called “Koulara” that look like bird nests and provide protection from harsh sun and wind. 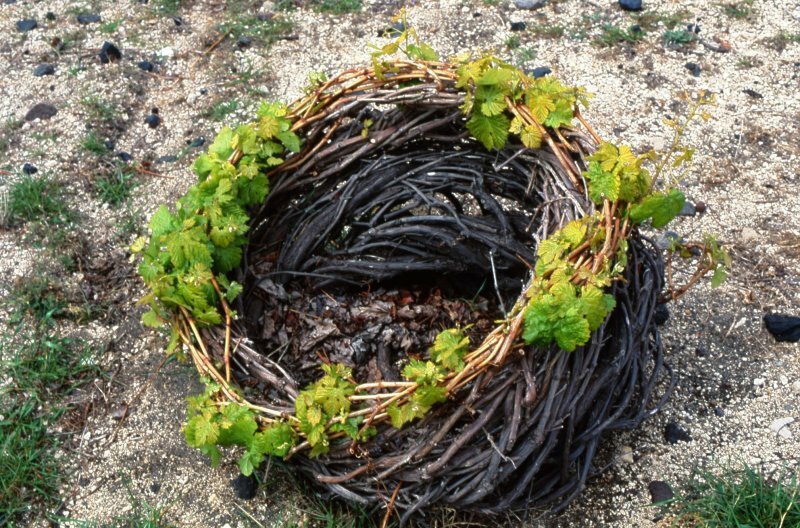 Eventually the yields (the amount of fruit that each vine provides) become so low because the nutrients much pass through so much vine, so the baskets are cut off at the root to produce a new vine. Some of the existing vines are very old, 75 years or more. Assuming this has happened several times over the last few centuries, the original rootstock could be hundreds of years old. Anyway, the Santorini winery owners, with a lot of support from the EU and Greece itself, put together a seminar and tasting the other day in Manhattan that I was happy to attend. During the seminar we began by tasting 8 white wines, all made 100% from Santorini’s own indigenous white grape Assyrtiko (Ah-seer-tee-koh). The first four were clean and fresh, fermented and aged in stainless steel, and as you might imagine they all showed really crisp and bracing acidity, minerality, and varying degrees of citrus. Some of us in the seminar thought these wines reminded us of Sauvignon Blanc, Chablis and even Gewurztraminer. The second flight saw a little or a bit more of oak, which softened the acid and gave them more roundness but didn’t soften the charm of the wines. One of them, which I really enjoyed, has been fermented with wild yeast and seemed much like a white Burgundy (Chardonnay) to me – and would make an outstanding food wine. The third flight was a departure I wasn’t expecting: four dessert wines, also made predominantly though not entirely from the Assyrtiko grape. The color of, I have to say it, cough syrup, these were delightful wines, not over-the-top sweet like many eiswines/ice wines I’ve tasted. Vin Santo, which some believe were named after this very island, are made by allowing bunches of grapes to dry in the sun, concentrating the sugars in the grapes so that when they’re crushed, the ratio of sugar to juice is much higher than normal. Gaia Assyrtiko Wild Ferment 2011: This is the one that reminded me of Chardonnay—mouth filling with lemon and tropical fruit and a hint of butter. Still had the acid but was a bit softer. Great food wine. Hatzidakis Santorini 2011. 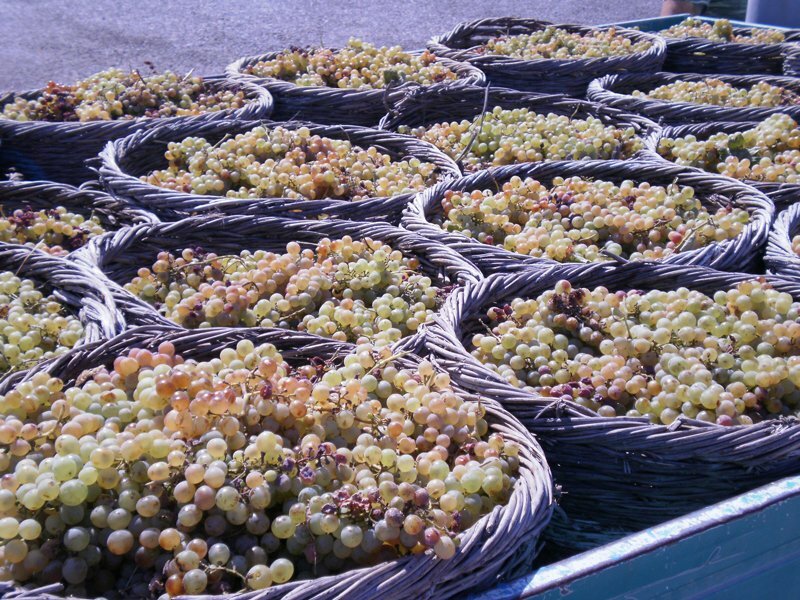 Classic Assyrtiko – crisp, sharply acidic, lots of citrus but with a hint of vanilla, and a medium to long finish. Great with salads. Karamolegos Santorini 2010. Lots of green apple and maybe some pear in this one, and of course the lemon. Nice finish. Santowines Nykteri 201. A bit darker than most of the other 100% Assyrtiko wines, this one was aged for 3 months in new French oak and had some noticeable pear in additional to citrus. More full-bodied but still refreshing. Hatzidakis Aidani 2011. Made from a different Grape, Aidani (with some Assyrtiko, too), this one has flavors of peaches and apricots and a nice long finish. Argyros Vinsanto 1989. Full-bodied, maple, cinnamon, hint of honey and lots of dried fruit and nuts. Very buttery and balanced with a nice long finish. 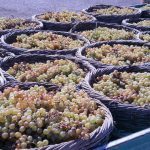 80% Assyrtiko and 10% each of Aidani and Athiri. Unlike a lot of other dessert wines, it’s only 14% alcohol. Wonderful stuff. Santowines Vinsanto 2004. Lots of sweet orange and brown sugar, this one was slightly less sweet but just as appealing. 80% Assyrtiko and 20% Aidani. There was also just one red wine, made 100% from the Mavrotragano grape, which I was told means “black and crispy” and is also native to Santorini. There are only 8 hectares of it on the island—meaning less than 20 acres of this grape in the entire world. When I asked two winemakers who were pouring it, Domaine Sigalis and Hatzidakis, where I could get it, they really didn’t know, so I wasn’t sure the point the of the exercise! It’s spicy, tannic, rich, and bursting with blackfruit. Reviews say it tastes like a Nebbiolo, but I don’t see that. I think it’s unique.